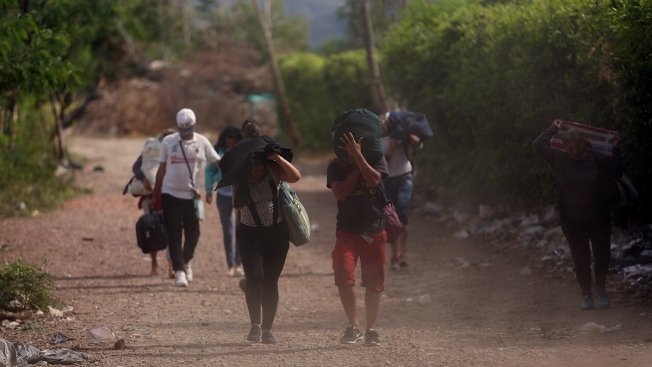 In this Aug. 31, 2018, photo, Venezuelans illegally cross from Venezuela into Colombia, to Villa del Rosario, along a path known as a "trocha." Some Venezuelans cannot cross through an official checkpoint because they lack the proper documents, such as a passport, so they instead traverse illegal dirt road crossings ruled by armed criminals dressed in green fatigues. Instead they traverse one of hundreds of illegal dirt road crossings that are ruled by armed criminals dressed in green fatigues. These illegal groups frequently rob and assault migrants who can't pay the equivalent of $10 in Colombian pesos or Venezuelan bolivars, or about half what a Venezuelan earning the minimum wage might make in a month. "You'll have to pay!" said an armed man who rummaged through their belongings. Authorities have struggled to wrestle control of the no-man's land between both nations. In the meantime, Venezuelans are being recruited into illegal activities such as drug trafficking. "They are very much in the wind," said Jeremy McDermott, executive director of InSight Crime, a group that studies organized crime in Latin America, "which makes them extremely vulnerable to exploitation and recruitment by organized crime." LOS PATIOS, Colombia — The small stand where Martha Elena Alarcon, 54, sells soda, chips and sugarcane juice is where many migrants fleeing by foot stop for a moment's rest. When Venezuelans began arriving at her doorstep about a year ago, she'd give them water and bread. Five travelers writing in black ink said they were "walking to a better life thanks to our president, who is either blind or a brute and making everyone in Venezuela flee." One pregnant woman traveling with her 3-year-old old daughter, Sofia, said the journey had been trying and wrote, "God please protect us." "She's OK!" the migrant told her in relief. TONA, Colombia — The road leading to the city of Bucaramanga passes through a frigid paramo known as "the icebox" that has struck fear into the hearts of migrants unprepared for temperatures down to 10 degrees below freezing. "They are risking their lives and those of their children," she said. Carlos Valdes, the head of Colombia's forensic medicine office, said he believes walkers have died from the cold but was unable to provide a number. One migrant told the AP he saw a family burying someone on the side of the road. Others have described seeing crosses and stones bearing names and death dates. Jonathan Suarez, 23, sat with tears streaming down his cheeks as he tried to get a ride. The previous day he had walked 25 hours and slept on the side of the roadway. The thought of his two girls back home - ages 3 and 8 months - kept him going. "I must press on, for them," he said. "It's hard sleeping next to people you don't know," she said. "You don't know if they're going to hurt you. But necessity forces you." "I'm terrified by what is happening," he said. But the vast majority of trucks and cars don't stop for the Venezuelans they see walking. Many have heard stories about migrants committing crimes. Truckers say they'd be fired if bosses found out they were carrying migrants and that their every move is tracked by GPS devices. Others fear incurring heavy fines from police. CALI, Colombia — A cellphone is a luxury most poor migrant walkers don't have, so those interviewed by the AP often asked to use their phones to send messages to relatives. One woman cried into a reporter's cellphone as she sent a message to her mother and toddler son back in Caracas after two days of walking. "All of this is for you both, mami," she sobbed. "I love you so much." Another young man arriving by bus in Cali sold his phone to get money for the journey. He used an AP phone to contact the only person he knew in the crime-ridden city — his friend's sister. "It's Jesus," he wrote her. "I've gone about two days without eating," he said. Many women with kids were turned back because they did not have written authorization from their children's father. AGUAS VERDES, Peru — At the crowded Peru-Ecuador border, many young migrants who had walked for weeks complained they'd been waiting days for authorities to process their entry request — and in the meantime weren't given any food or water. As 21-year-old Jean Paul Flores spoke of his shared frustration to the AP, dozens cheered and applauded in agreement. Flores worked at an international call center in Venezuela and left behind his five-months-pregnant wife. He knew if he stayed, he wouldn't be able to buy diapers for his baby. "Staying and accompanying her during nine months of pregnancy would mean sacrificing the childhood of my baby," he said. "It's not worth it." "We just want to obtain our objective: To save our families from what is happening there," he said. Over 400,000 Venezuelans now live in the Andean nation, most arriving over the last year. Many are drawn by Peru's economy, which is expected to grow nearly 4 percent this year, faster than other countries in the region. While some migrants hope they'll return to Venezuela, most interviewed by the AP believed their move would be permanent. Their only hope was to earn enough money so they could bring the rest of their family, too. Migrant Sandra Cadiz and her daughter initially stayed with her older son and his family, but the landlord of the tiny room didn't want so many people living there. In the week since they've lived in two different shelters. "I have a home in Venezuela," Cadiz says. "But I don't have one here."